Beautiful sweet lemon smell when you rub the leaves. 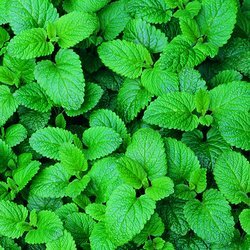 Lemon Balm can grow up to 3 feet tall. Can be used to flavour tea and alcohol and to help flavour cooking dishes. When crushed and rubbed on the skin it can help towards repelling mosquitos&comma; and can help to treat colds&comma; relive headaches and cold sores.